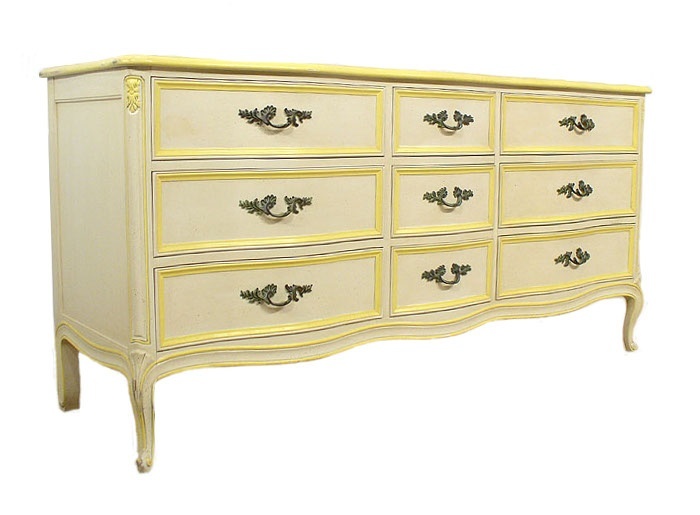 Drexel produced a stunning french provincial furniture set from the mid 1950s through the mid 1960s called Touraine which is still quite popular today. Drexel designed both a bedroom set and a dining set in this series. The furniture was inspired by the curvy lines classically found in Louis XV furniture which became popular during the period of 1730 to 1775. 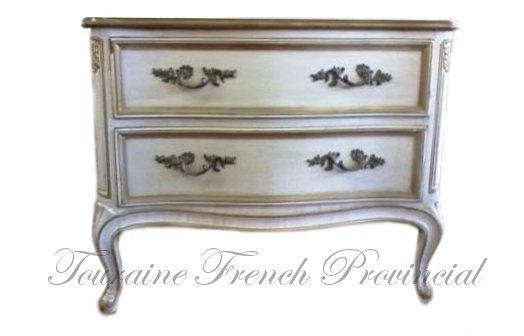 The Touraine bedroom dresser sets featured very soft lines which were accented with gold and cream. Louis XV furniture often has a very feminine look which can seem very sensuous and romantic. The unbroken curves are one of the key features of classic Louis XV furniture. 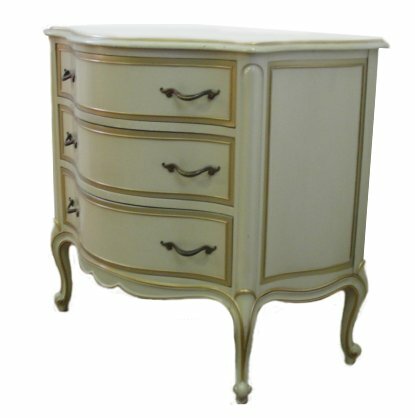 This unique style is expressed in the delicate curves of Touraine dressers which extend down from the drawers to the legs of the furniture. The Touraine collection is one of the only french provincial collections to feature a serpentine shape other than Bassett's Versailles collection. Serpentine chests and Bombe furniture is quite difficult to create and quite hard to find. A genuine antique french serpentine chest can be quite rare and pricey for any collector. The larger 9 drawer Touraine chests feature 6 side drawers and 3 smaller middle drawers. This unique design offers a substantial amount of storage space. The nightstands in the Touraine series do a great job of drawing inspiration from genuine Louis XV nightstands which feature a slender style often not seen in other french provincial collections. Prices can vary greatly for individual pieces in the Touraine collection, and complete sets often go for $1500- $2800 depending on the condition. 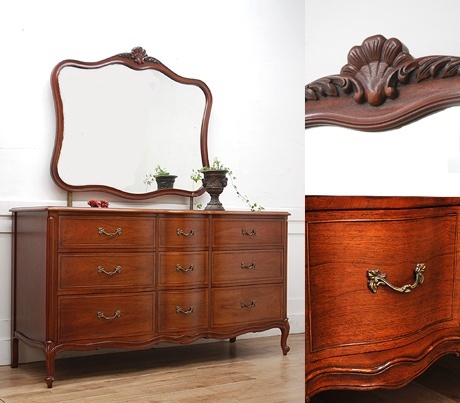 I am looking for a drexel french provencial dresser to match the other pieces in guest room. We don’t sell any furniture, rather we blog about what you can buy and decorating ideas. If you bookmark this page, and check it often, I guarantee that you will run across the perfect piece. 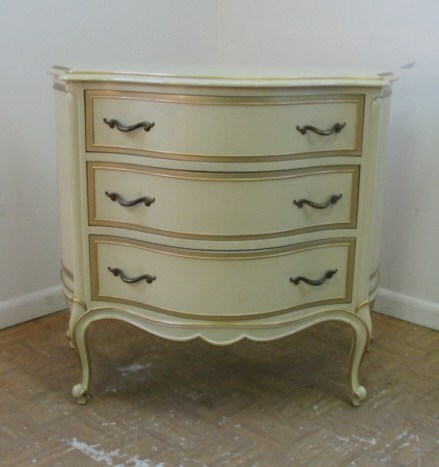 I have the Drexel French Touraine bedroom suite available for sale in North Carolina. Full size Carved Shell bed, 5 drawer dresser, 1 night stand, vanity with 6 drawers, mirror and upholstered bench. The dresser, vanity and night stand have custom made glass tops. All are in excellent condition. You may contact me via email if you are interested in pictures. piercy07@yahoo.com. I am in the process of converting the Drexel Touraine 3 drawer bombay chest into a bath vanity with vessel sink for my powder room. I’ll post photo when complete. 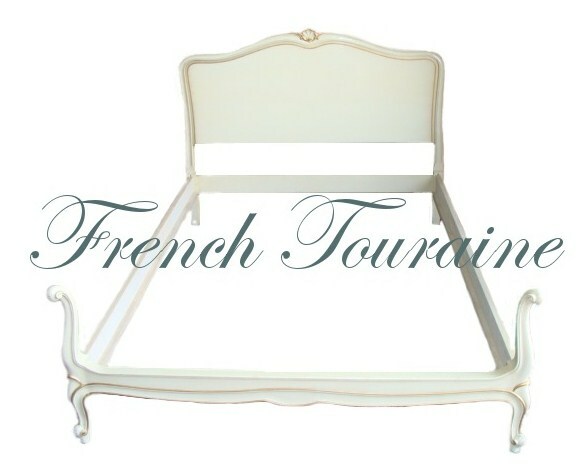 I have been collecting the Drexel Touraine Bedroom furniture for my bedroom. Now I’m ready to restore and I would like to keep the same colors and finishes. Does anyone know what the best way to go about doing this. I love the original finishes, I would love to be able to keep it that way. The pieces I have need a lot of work. I have several refinished pieces of Drexel Touraine that belonged to my parents. The 9 drawer dresser and landscape mirror as seen above, the three drawer bombe chest and mirror as seen above, and a threadbare little bench that needs to to be reupholstered. Located in western PA and motivated to sell because marrying and moving into a fully furnished house in Virginia. I have a couch, arm chair, and two end tables (set) – french provincial circa 1965. It was reupholstered in the 80s. No longer original turquoise silk; couch has green and gold velveteen and chair is all gold. The couch is 7′ long. All pieces are worn. Chair has some cat claw damage on the side. Can anyone help me determine a fair re-sale price? Does anyone have the three drawer Bombay chest pictured above for sale. I’m in California. I have 18 pieces of Drexel Touraine furniture for sale. The bedroom suite includes a full size bed with nine drawer dresser/mirror, two three drawer night stands and dressing table/chair. The dining room suite has table, 2 arm chairs, 6 side chairs, buffet, breakfront and tea/cutlery piece. I am located in Los Angeles. I have the dark finish 9 drawer triple dresser with mirror for sale. My mirror was never attached to the dresser. It has a wire for hanging on the wall. 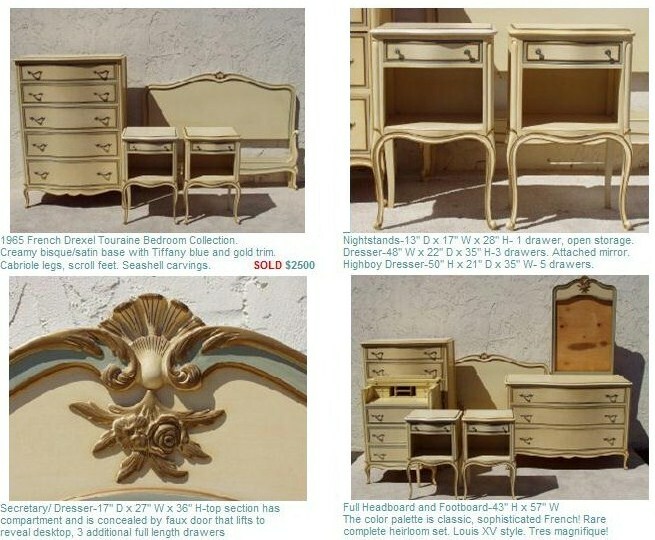 I’m currently selling my complete King Size 5pc French Provisional Touraine Set on Craigslist Pensacola Florida site. Pictures posted. 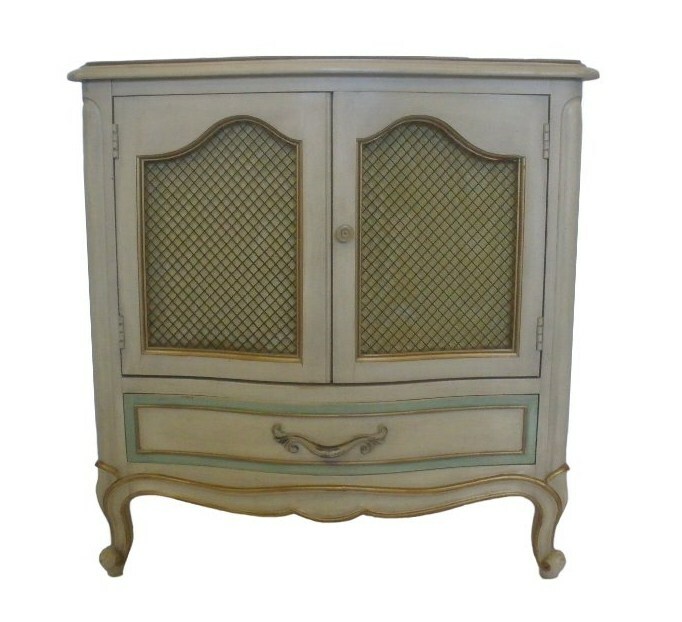 Keep the “Shabby Sheek” look (Yellowing and lite crackling paint) or refinish. 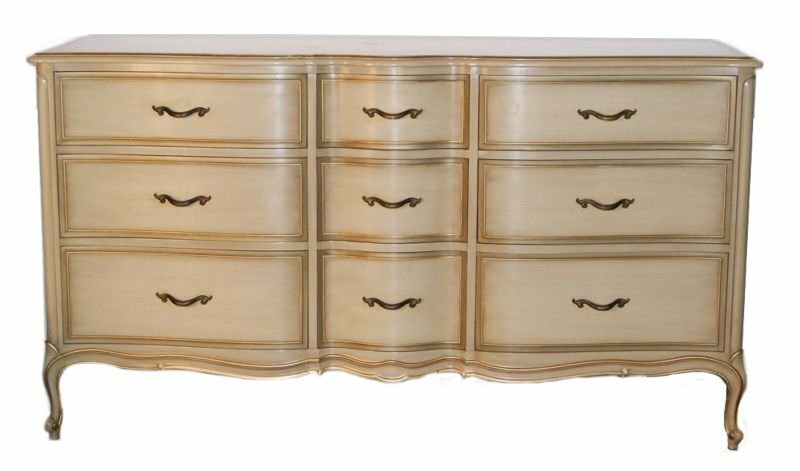 I have the 9 Drawer Chest (2nd one down) with Landscaped Mirror featured above, Tall Bureau, one night stand (featured in the group which looks like two eyeballs and big mouth design), and King Size Head Board – All matching creme and gold trim. I have the Touraine custome desk. It looks like a regular dresser and the top drwar puuls up to expose little shelves and drwars and an extending wood writing area. In great condition and have pics available. I have not seen this piece for sell anywhere else. Comment if you would like to purchase. 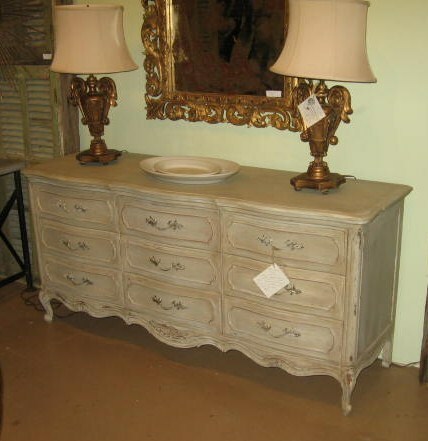 Looking for a pair of French Provencial 3 drawer chests to use as bedside tables. Please email me if you have a pair. Thanks! Also would love a king and queen headboard and a bench. 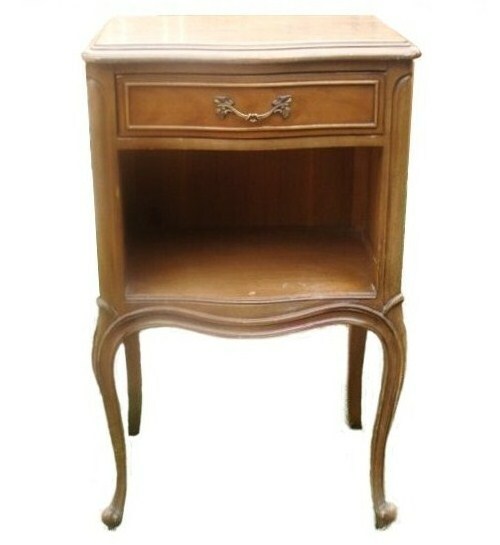 I am looking for the drexel touraine vanity or desk with the matching chair. I am also looking for the full size bed. If anyone has it for sale, please let me know. I have the Drexel Touraine Custom bedroom suit available that comes with bed, 2 night stands, 6 drawer high chest dresser, and vanity. The Vintage set is all matching numbers. Or mms text at 832-643-0470. I am selling two night stands, tall boy dresser, nine drawer dresser and mirror. Needs to be refinished but in very good condition. Please email me if interested. Located in North Carolina. I am in need of several pieces. Please contact me especially if you are in Los angeles, California, however I will travel for the right piece. I have 2 3 drawer bachelors chests for sale. Drexel Touraine . Made in 1942. The earliest date I have seen anywhere. I think it was the first year they made them. Descriptions also say carved demi lune whatever that means. I’m looking bedroom chair, vanity, bench, and king headboard . Also need the 3 drawer commode. Barbara do you have any pieces left. Neither is this one. https://uploads.disquscdn.com/images/39134ec697fa81bba4d63c327bfc8fe08bd4369bc2c0b436bdaa4b92ae16dd81.jpg Also a Henredon piece.